As Stephanie Yee noted yesterday, spring is right around the corner in West Philadelphia. Flowers are starting to bloom, the temperature is rising above 50 degrees, and the sun is staying out until nearly 7:30 p.m. One of my favorite things about the warmer weather is the increased opportunity for street food. 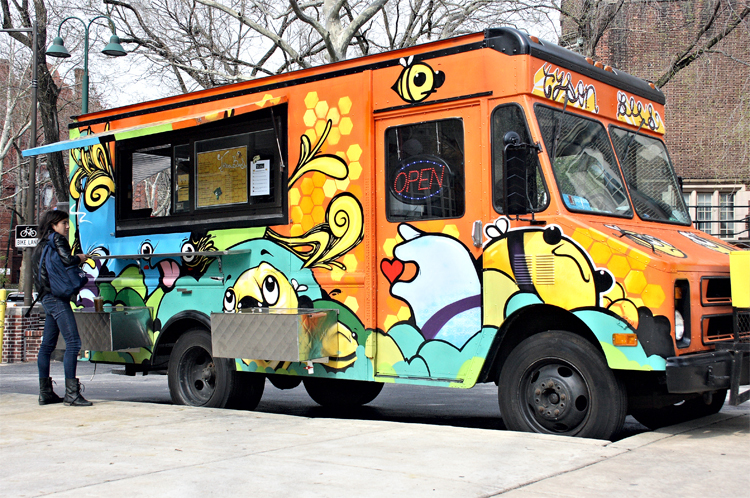 As many of you know, University City and Penn’s campus is no stranger to food carts, and every year more gourmet options are available for sidewalk consumption. Some of my local favorites include Magic Carpet and Tyson Bees (love the thai basil chicken tacos!). The Tyson Bees food truck. 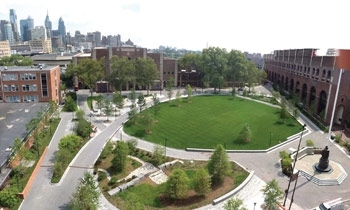 New green space, Shoemaker Green, provides a great spot for eating lunch outdoors. If you’re willing to hoof it over to Drexel’s campus (in the 33rd and Arch vicinity) then a whole new array of food options becomes available: Say Cheese Philly, Rival Bros Coffee, Mac Mart Truck, Pitruco Pizza, Lucky Old Souls, and Spot Burger to name just a few. Some of these trucks move from location to location and therefore my Twitter account has been devoted to following many of these delicious vehicles. Click on some of the names above to check out their Twitter accounts and to follow them around the city. 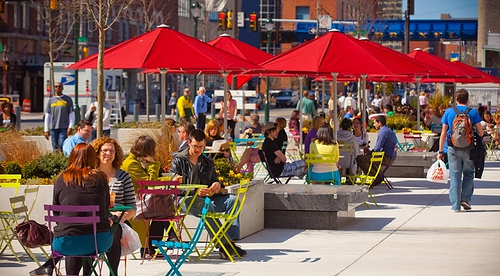 To continue your tour of University City food truck treats, check out The Porch at 30th Street Station. It’s about a 10 minute walk from Penn’s campus, but well worth the effort. Two days ago, on April 1st, The Porch opened it’s 2013 season with live music, entertainment and (surprise!) more food trucks. With its spring kickoff, The Porch reveals an event calendar jam-packed with fun (and free) events all month long, with more programming to come throughout the spring and summer. You can read more about this great public space here but the takeaway is: new mobile food trucks stop here during the spring, summer, and fall months. On Wednesdays you will find The Cow and The Curd, Cupcake Carnivale, Lucky Old Souls, and The Sunflower Truck Stop. On Fridays, Just Jackie’s Food Truck, Say Cheese, Spot Burger, and Sweetbox Cupcakes. After a long winter cooped up inside eating packed lunches, I am excited to explore my new food options in the increasingly warmer sun! I’m a Penn alum (’99)and I was just thinking about those food trucks! I’ve never heard of the ones mentioned- obviously been a while! My favorite when I was there was this Mexican food truck- can’t remember The name- parked in front of 36th and Spruce. Great food! Fun times!